These are actually the second bake of last week. 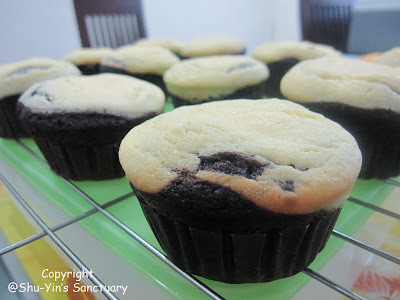 I baked these last Thursday because I could not resist the temptation of tasting the delicious combination of rich chocolate cake and creamy cheesecake - Black Bottom Cupcakes. Shu-Min likes it. Hubby likes it. Mum likes it. 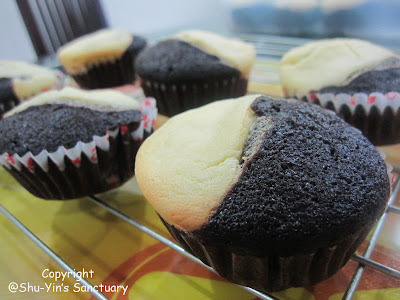 shuey, next time u come back, i bake u smtg ok? but not good i dunno wan lor. coz usually i only bake the same recipe ONCE. seldom twice. so not expert wan!